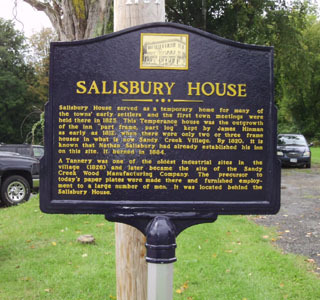 Sandy Creek History Center is located on the first floor of the Sandy Creek Town Hall with parking in the back of the building and is completely handicapped assessable. The History Center is open every Friday from 9am to 3pm. S 57.07. Local historian; appointment; maintenance of historical edifices. 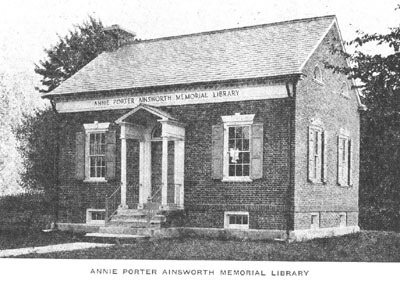 A local historian shall be appointed, as provided in this section, for each city, town or village….Such historian shall be appointed….for a town by the supervisor; for a village, by the mayor….Each local government historian shall promote the establishment and improvement of programs for the management and preservation of local government records with enduring value for historical or other research; encourage the coordinated collection and preservation of non-governmental historical records by libraries, historical societies, and other repositories; and carry out and actively encourage research in such records in order to add to the knowledge, understanding and appreciation of the community's history. The local authorities of the city, town, village or county for which such historian is appointed, may provide the historian with sufficient space in a safe, vault, or other fire proof structure for the preservation of historical materials collected. Such local authorities….are hereby empowered to appropriate, raise by tax and expend moneys for historical purposes within their several jurisdictions, including historical edifices, the erection of historical markers and monuments, the collection of war mementos, and, either alone or in cooperation with patriotic or historical organizations, the preparation and publication of local histories and records and the printing and issuing of other historical materials in aid of the work of the local historian…. The following information is highlighted by various old photos in no special order and not necessarily related to the accompanying text. The photos you see on this page are all available for purchase at the History Center in Sandy Creek, along with hundreds of other photos. Click on them to see the full size versions. “The first settlers came to what is today the Town of Sandy Creek in 1803. 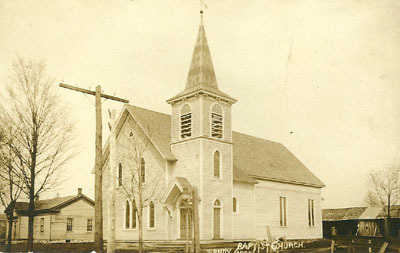 March 1825 this town was incorporated and from that time on interested people began to document and save our history. 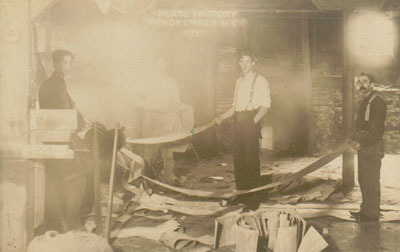 After a serious of devasting fires Lacona and Sandy Creek Village fire departments were formed. Our first historian was Nanette Hamer who was appointed in the 1920’s, probably before 1925 since that was the first documented artifact listed in the history collection. About 1927, the original copy of the 1845 census was found in a home and from that the names were taken and put into the newspaper asking for information on those families. The series was called “Sketches.” Much of the genealogy we have today began with this Sketches newspaper article. Each historian since has put their efforts towards a different area of historic preservation. Why create a fire-safe room? Why does Sandy Creek need one? 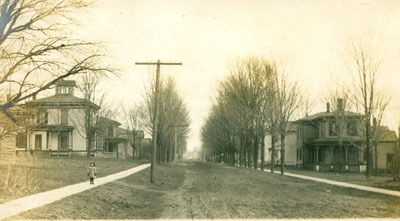 In 2000 the Town Supervisor, Margaret Kastler, asked the state to conduct a “needs assessment” on the Town history archives. The Town Supervisor (Margaret Kastler), Town Clerk, (Margaret Wing) and past historian (Tammy Wheeler), were present when Joseph Swinyer, the Documentary Heritage Program (DHP) representative came to do the assessment. Mr. Swinyer wrote the advisory report and in it stated a need to get ALL town history materials back to the Town Hall, accessioned, processed, organized and placed in a secure, fire-safe room. The report was shelved and nothing was done until I became historian in August 2001. The DHP report was, in part, used in preparing the 2002-2003 LGRMIF grant application for updating facilities (fire-safe room) and for getting the active and inactive records processed and properly stored. When I was appointed historian, the records were in quite a mess after most were returned to the Town Hall basement and piled high on many tables. Sadly, some materials are lost to us forever and in some cases, the integrity and provenance of the records have been permanently altered. There was a definite need to gather, reassess and reorganize the town’s history in one place. I have put in many hours organizing and checking accession numbers to return materials to their original collections (where possible) while being careful to preserve and catalogue everything I found. The fire-safe room will secure, protect and make all the active and inactive records more accessible to the town and both villages. Most importantly the records will be in one place with easy access, while keeping then secure and preserving them for future generations. In 2003 we held a yearlong celebration to commemorate the 200 th anniversary of the first settlers coming to what is today the town of Sandy Creek., every month we had a different event or speaker. * All books are completely illustrated and document Sandy Creek history for future generations. Many of the gravestones in these old cemeteries are broken or so badly deteriorated that they are hard to read and waiting even another year to document these cemeteries would have been unthinkable. 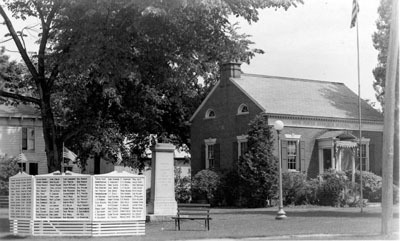 Each gravestone is photographed and a genealogy of each family buried there is included as it pertains to town history. Saturday, May 31, 2008 we remembered and dedicated the burial place of two Revolutionary Soldiers, Stephen Lindsey and Jonathan Thrasher at Pioneer/Goodenough District Cemetery on Henderson Road. 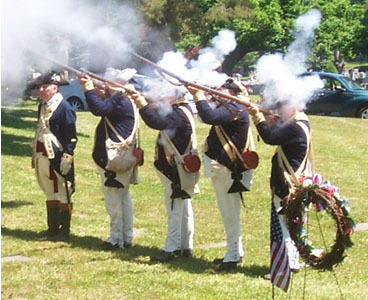 The Continental Arms Collectors Association’s Revolutionary War Interpretive Unit, headed by George Clark, reflects a company from the 1st NY Regiment, Continental Army circa 1782. They use 1779 Regulations for the Order and Discipline of the Troops of the United States and they offer a firsthand glimpse of our Nation's colorful military history. The Continental Arms Collectors Association, Inc. was founded in 1982 as a Not-for-Profit educational organization. Their mission: “to enhance public knowledge on the significance of firearms in American History.” The Revolutionary War Interpretive Unit was introduced in 1992 to further educate the public about daily life in the Continental Army. Extensive research culminated in the selection of accurate reproduction weapons, accoutrements, equipment, headgear, footwear, and clothing in use by the unit. The high standard for the group’s accurate performance of military drills and ceremonies, in use by the Continental Army during the latter part of the War of Independence, is a result of the intense training the unit is committed to. Other participants included the VFW and the DAR. Invitations have been sent to the 4 th and 7 th graders at Sandy Creek Schools. Local family members from Sandy Creek, Florida, Michigan and Maryland will be in attendance. 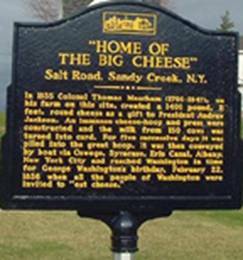 “Home of the Big Cheese” Salt Road, Sandy Creek, N.Y. 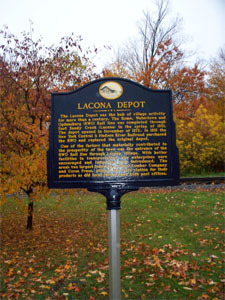 The Lacona Depot was the hub of village activity for more than a century. The Rome, Watertown and Ogdensburg (RWO) Rail line was completed through East Sandy Creek (Lacona) in the spring of 1851. The depot opened in November of 1872. In 1891 the New York Central & Hudson River Railroad purchased the RWO and replaced the original depot. One of the factors that materially contributed to the prosperity of the town was the entrance of the RWO Rail line through Lacona Village. With better facilities in transportation, new enterprises were encouraged and industries were introduced. 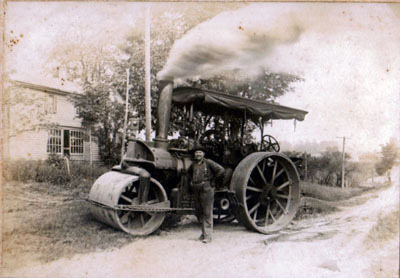 The area’s two largest industries, Blount Lumber Company and Corse Press, utilized the train station for their products as did local farmers and both post offices.